Get back in tune with nature in Roaring Wilds, a 5 reel, 40 payline video slot powered by Playtech. Set in a rural wilderness, it comes with stacked symbols and a free spins feature that awards 15 free spins. Join the flora, fauna and wild beasts from between 40p and £2,000 per spin. A tranquil mountaintop setting forms the backdrop to the reels in Roaring Wilds – the symbols on the reels maintain the rugged, outdoorsy feel. Joining the lower value playing cards are fish and eagles which award up to 100x, a big cat who pays up to 200x and the bear, who is the wild, who’ll get you 200, 500 or even 1,000x if you land 5 on a payline. All symbols can land in a stacked formation, further enhancing your chances of creating multiple winning combinations. Roaring Wilds comes with a Free Games feature which is triggered by landing 3 or more of the paw print scatter – once activated, you’ll be awarded 15 free spins. Find the scatters again during the feature and you can look forward to another 15 free spins. There’s no limit to the amount of times the feature can be re-triggered! 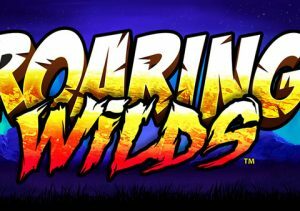 Roaring Wilds is simple fare – the graphics, perfectly easy on the eye as they are, won’t be winning any awards. The same goes for the gameplay. Just fire it up, press play and away you go. Basic doesn’t necessary mean boring though and Roaring Wilds can be just as dangerous as the animals that appear on the reels. This is a volatile slot so expect plenty of dry spells when the wins will seemingly disappear into the wilderness. The upshot is that it’s possible to land a massive stack of coins in next to no time, especially during the feature. If you like wild action to go with the wild genre, then this nature-themed adventure is a trek worth making. If you like the theme, NextGen Gaming’s Wolfpack Pays and Play ‘N Go’s Wild North are recommended.